It all begins with a complete examination and modeling of your existing teeth, gum and jaw structures. In many cases, a physical impression (replica) of the jaws is made, which will aid in planning the location of the new teeth. But the modeling doesn't stop there: A high-tech, three-dimensional CT (computed tomography) scan is also performed. 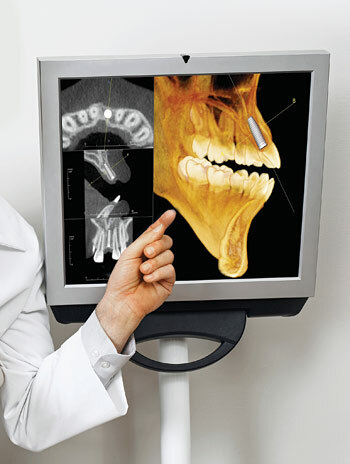 This allows us to examine the structures (including bone, nerve tissue and sinus cavities) which lie inside the jaw. It is often accomplished using “cone-beam” CT technology, in which the scanning device quickly captures a complete digital image of internal structures as it rotates around your head.